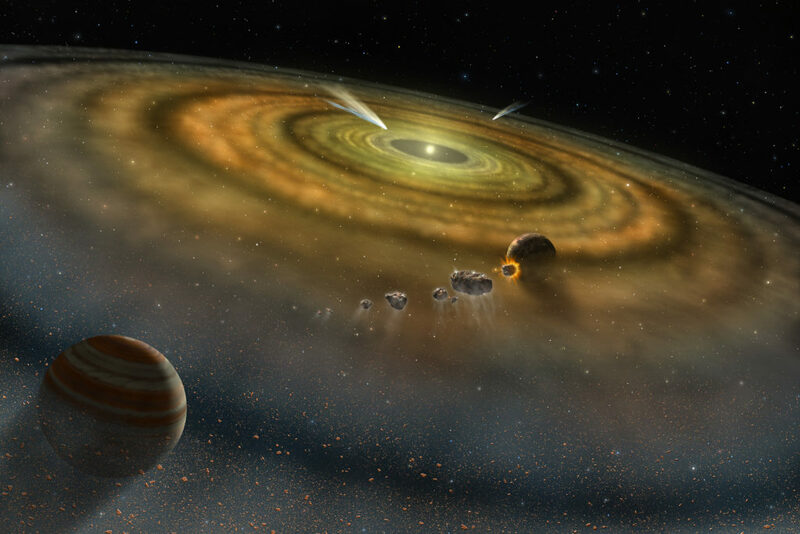 Artist impression of an early solar system. Credit: NASA. About a decade ago, a violent explosion roughly 23 miles above the surface sent incendiary fragments hurling towards the dunes of the Nubian desert in Sudan. In and of itself, the event was not necessarily impressive, apart from the fancy light show — after all, our planet is constantly bombarded by relatively small objects. But, according to a new study, these meteorites have a much more dramatic origin and history than meets the eye. Scientists say that under the meteorites’ thick carbonized exterior hid diamonds which enclosed remnants of a long-lost planet or planetary embryo during the crazy days of the early solar system. A jeweler wants diamonds to be perfect, meaning impurities should be kept to a minimum, ideally none at all. However, a diamond with inclusions is far more valuable from a scientific standpoint than a so-called flawless jewel. Because diamonds are forged at immense pressures and temperatures, typically deep inside the planet, the various materials that get trapped inside are quite hard to get a hold of at the surface — and diamonds can preserve them for billions of years. 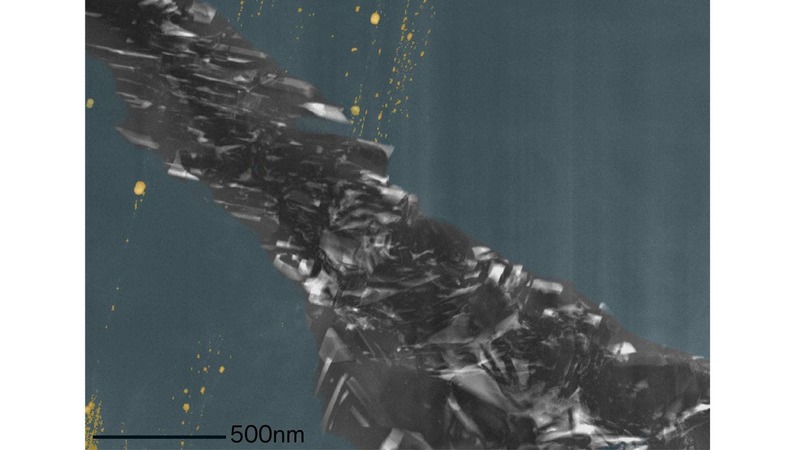 The team led by Farhang Nabiei of the Ecole Polytechnique Federale de Lausanne in Switzerland was initially investigating the relationship between the diamonds and the layers of graphite surrounding them, when they realized the small pockets of material trapped inside looked far more interesting. With the help of a high-power electron microscope, the researchers studied the tiny diamonds inside a thin section of the meteorite and were astonished to learn they were formed at incredibly high pressures — much higher than any kind of pressure the meteorites might have been subjected to when they crashed into Earth. 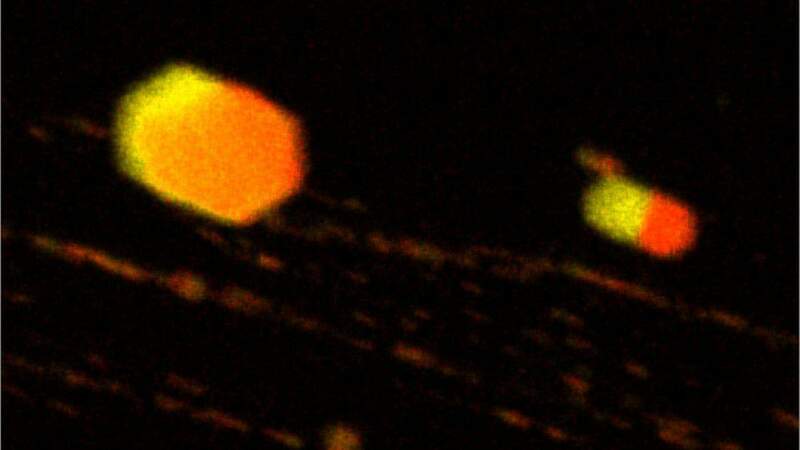 A chemical map shows sulfur (red) and iron (yellow) inside the inclusions in the diamond matrix. Credit: Dr. F. Nabiei/Dr. E. Oveisi, EPFL, Switzerland. Specifically, the diamonds must have formed at 20 gigapascals, which is the kind of pressure found deep within a planet the size of Mars or Mercury — but the meteorites come from neither of these planets or any other planet that we know of for that matter. The meteorites have, in fact, been classed as ureilites — a rare type of stony meteorite that has a unique mineralogical composition, very different from that of other stony meteorites. Transmission electron microscopy also revealed traces of chromite, phosphate, and iron-nickel sulfides inside the larger diamonds, which are inclusions that can be found in Earth’s diamonds, too. It’s the first time such inclusions have been identified inside extraterrestrial diamonds. A colorized image shows the diamond phase (blue), inclusions (yellow) and the graphite region. Credit: Dr. F. Nabiei/Dr. E. Oveisi/Prof. C. Hébert, EPFL, Switzerland. The size of the diamonds is another clue that we’re dealing with some very peculiar objects. Their average size is about 100 microns, which is about the size of a human hair. That may not sound like much, but that’s still larger than any diamond that could possibly form by shock transformation of graphite (i.e. when a meteorite crashes on Earth). This suggests that the diamonds formed deep in a body’s interior and not on impact. Such a planetary-sized body is now long gone, having been destroyed in a cataclysmic game of billiard early on in the solar system’s history. These early proto-planets would have been hurled towards each other by a tug of war between the gravities of a young Jupiter and the sun. The environment likely looked very crowded too, with multiple Mars-sized protoplanets destined to collide into each other. “This study provides convincing evidence that the ureilite parent body was one such large ‘lost’ planet before it was destroyed by collisions [some 4.5 billion years ago],” researchers wrote in the new paper on the subject, published this week in the journal Nature Communications. The discovery offers new insight into our solar system’s tumultuous past, helping piece together how it all came to be. This is merely the beginning, as hundreds of other ureilites could offer new clues to the nature of the early solar system and the evolution of its planets.